TBC Owner, Artem Sharoshki,n wanted something dramatic and different for The Boxing Club in downtown. 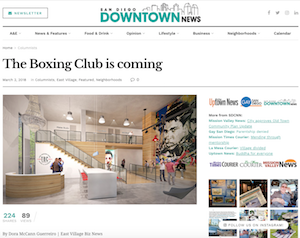 The Boxing Club is officially coming to downtown San Diego and here is what you can expect. 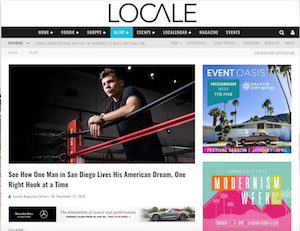 Pacific Magazine interviews The Boxing Club's Artem Sharoshkin. 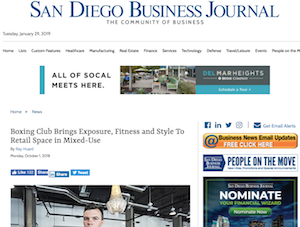 San Diego Charger, Corey Liuget, explores the new sensation called Joga, or yoga for jocks, at TBC. Tips from TBC personal trainer, Jessica Lopez, on common mistakes you're making in the gym and how to fix them. TBC personal trainer, Jessica Lopez, shares a beginner's guide to kickboxing for all levels. Former UFC veteran and Jiu Jitsu Black Belt, Shannon Gugerty, teaches women in the SD community how to defend themselves. TBC trains UTC champion football players on how to cross train using a boxing routine. The Boxing Club hosts the press event for Glory 21, where our resident fighter, Artem Levin, will be defending his belt. Longtime TBC member shares her experiences being a part of the TBC community on her blog. Artem Levin, one of the top pound-for-pound kickboxers who trains at TBC, discusses his upcoming plans for his career. The Boxing Club (TBC) announced that Artem Sharoshkin joins Patrick Van Schoote as a new co-owner and operating partner of the company in May 2014. TBC's resident fighter, Artem Levin, explains why he chose TBC and San Diego as his kickboxing home.